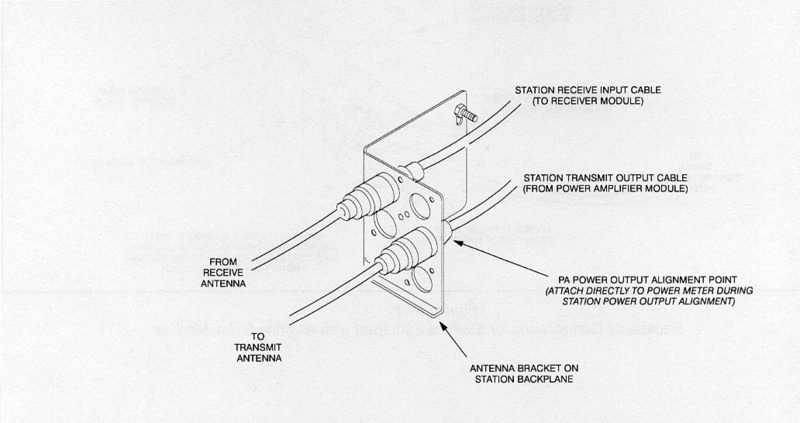 If the station requires both a transmit antenna and a receive antenna, the rf cabling to/from the antennas may be connected either separately or through a single connection with an antenna relay (Option X371). Stations intended for separate transmit and receive antennas are shipped with the coaxial cables from the Power Amplifier Module and to the Receiver Module connected to the antenna bracket on the Backplane. The antenna bracket has two rows of three holes each. The inner row is for the receive antennas while the center position of the outer row is for the transmit antenna. Connect the rf cables from the transmit and receive antennas to the N-type female connectors on the bracket as shown in Figure 8 —1.